"Main Street of America" redirects here. For other uses, see Main Street, America. "The Mother Road" redirects here. For the route in China, see China National Highway 312. U.S. Route 66 (US 66 or Route 66), also known as the Will Rogers Highway, the Main Street of America or the Mother Road, was one of the original highways in the U.S. Highway System. 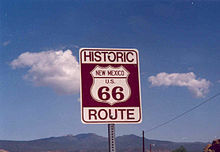 US 66 was established on November 11, 1926, with road signs erected the following year. The highway, which became one of the most famous roads in the United States, originally ran from Chicago, Illinois, through Missouri, Kansas, Oklahoma, Texas, New Mexico, and Arizona before ending in Santa Monica in Los Angeles County, California, covering a total of 2,448 miles (3,940 km). It was recognized in popular culture by both the hit song "(Get Your Kicks on) Route 66" and the Route 66 television show in the 1960s. In John Steinbeck's classic American novel, The Grapes of Wrath (1939), the road, "Highway 66", was turned into a powerful symbol of escape and loss. US 91 from San Bernardino to Barstow, Cal. US 93 / US 466 in Kingman, Ariz. US 666 from Sanders, Ariz. to Gallup, N.M.
US-77 in Oklahoma City, Okla.
US-166 in Baxter Springs, Ks. 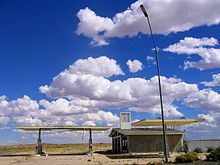 US 66 served as a primary route for those who migrated west, especially during the Dust Bowl of the 1930s, and the road supported the economies of the communities through which it passed. People doing business along the route became prosperous due to the growing popularity of the highway, and those same people later fought to keep the highway alive in the face of the growing threat of being bypassed by the new Interstate Highway System. US 66 underwent many improvements and realignments over its lifetime, but was officially removed from the United States Highway System in 1985 after it had been replaced in its entirety by segments of the Interstate Highway System. Portions of the road that passed through Illinois, Missouri, New Mexico, and Arizona have been communally designated a National Scenic Byway of the name "Historic Route 66", returning the name to some maps. Several states have adopted significant bypassed sections of the former US 66 into their state road networks as State Route 66. The corridor is also being redeveloped into U.S. Bicycle Route 66, a part of the United States Bicycle Route System that was developed in the 2010s. While legislation for public highways first appeared in 1916, with revisions in 1921, it was not until Congress enacted an even more comprehensive version of the act in 1925 that the government executed its plan for national highway construction. 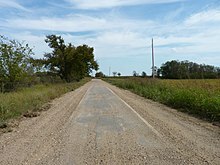 The original inspiration for a roadway between Chicago and Los Angeles was planned by entrepreneurs Cyrus Avery of Tulsa, Oklahoma, and John Woodruff of Springfield, Missouri. The pair lobbied the American Association of State Highway Officials (AASHO) for the creation of a route following the 1925 plans. The numerical designation 66 was assigned to the Chicago-to-Los Angeles route on April 30, 1926, in Springfield, Missouri. A placard in Park Central Square was dedicated to the city by the Route 66 Association of Missouri, and traces of the "Mother Road" are still visible in downtown Springfield along Kearney Street, Glenstone Avenue, College, and St. Louis streets and on Route 266 to Halltown, Missouri. Championed by Avery when the first talks about a national highway system began, US 66 was first signed into law in 1927 as one of the original U.S. Highways, although it was not completely paved until 1938. Avery was adamant that the highway have a round number and had proposed number 60 to identify it. A controversy erupted over the number 60, largely from delegates from Kentucky who wanted a Virginia Beach–Los Angeles highway to be US 60 and US 62 between Chicago and Springfield, Missouri. Arguments and counterarguments continued throughout February, including a proposal to split the proposed route through Kentucky into Route 60 North (to Chicago) and Route 60 South (to Newport News). The final conclusion was to have US 60 run between Virginia Beach, Virginia, and Springfield, Missouri, and the Chicago–L.A. route be US 62. Avery and highway engineer John Page settled on "66," which was unassigned, despite the fact that in its entirety, US 66 was north of US 60. After the new federal highway system was officially created, Cyrus Avery called for the establishment of the U.S. Highway 66 Association to promote the complete paving of the highway from end to end and to promote travel down the highway. In 1927, in Tulsa, the association was officially established with John T. Woodruff of Springfield, Missouri, elected the first president. In 1928, the association made its first attempt at publicity, the "Bunion Derby," a footrace from Los Angeles to New York City, of which the path from Los Angeles to Chicago would be on US 66. The publicity worked: several dignitaries, including Will Rogers, greeted the runners at certain points on the route. The race ended in Madison Square Garden, where the $25,000 first prize (equal to $364,777 in 2018) was awarded to Andy Hartley Payne, a Cherokee runner from Oklahoma. The U.S. Highway 66 Association also placed its first advertisement in the July 16, 1932, issue of the Saturday Evening Post. The ad invited Americans to take US 66 to the 1932 Summer Olympics in Los Angeles. A U.S. Highway 66 Association office in Oklahoma received hundreds of requests for information after the ad was published. The association went on to serve as a voice for businesses along the highway until it disbanded in 1976. Traffic grew on the highway because of the geography through which it passed. Much of the highway was essentially flat and this made the highway a popular truck route. The Dust Bowl of the 1930s saw many farming families, mainly from Oklahoma, Arkansas, Kansas, and Texas, heading west for agricultural jobs in California. US 66 became the main road of travel for these people, often derogatorily called "Okies" or "Arkies". During the Depression, it gave some relief to communities located on the highway. The route passed through numerous small towns and, with the growing traffic on the highway, helped create the rise of mom-and-pop businesses, such as service stations, restaurants, and motor courts, all readily accessible to passing motorists. In the 1950s, US 66 became the main highway for vacationers heading to Los Angeles. The road passed through the Painted Desert and near the Grand Canyon. Meteor Crater in Arizona was another popular stop. This sharp increase in tourism in turn gave rise to a burgeoning trade in all manner of roadside attractions, including teepee-shaped motels, frozen custard stands, Indian curio shops, and reptile farms. Meramec Caverns near St. Louis, began advertising on barns, billing itself as the "Jesse James hideout". The Big Texan advertised a free 72-ounce (2.0 kg) steak dinner to anyone who could consume the entire meal in one hour. It also marked the birth of the fast-food industry: Red's Giant Hamburg in Springfield, Missouri, site of the first drive-through restaurant, and the first McDonald's in San Bernardino, California. Changes like these to the landscape further cemented 66's reputation as a near-perfect microcosm of the culture of America, now linked by the automobile. From downtown St. Louis to Gray Summit, Missouri, US 66 originally went down Market Street and Manchester Road, which is largely Route 100. In 1932, this route was changed and the original alignment was never viewed as anything more than temporary. The planned route was down Watson Road, which is now Route 366 but Watson Road had not been completed yet. The ghost town of Two Guns, Arizona, once featured a zoo, gift shop, restaurant, campground, gas station, and "death cave". 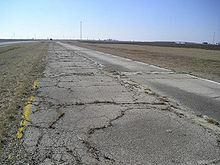 In some cases, such as many areas in Illinois, the new Interstate Highway not only paralleled the old US 66, it actually used much of the same roadway. A typical approach was to build one new set of lanes, then move one direction of traffic to it, while retaining the original road for traffic flowing in the opposite direction. Then a second set of lanes for traffic flowing in the other direction would be constructed, finally followed by abandoning the other old set of lanes or converting them into a frontage road. With the decommissioning of US 66, no single interstate route was designated to replace it. I-55 covered the section from Chicago to St. Louis; I-44 carried the traffic on to Oklahoma City; I-40 took the largest chunk, replacing 66 to Barstow, California; I-15 took over for the route to San Bernardino; and California State Route 66, I-210 and State Route 2 (SR 2) or I-10 carried the traffic of US 66 across the Los Angeles metropolitan area to Santa Monica, and the beach. The first Route 66 associations were founded in Arizona in 1987 and Missouri in 1989 (incorporated in 1990). Other groups in the other US 66 states soon followed. In 1990, the state of Missouri declared US 66 in that state a "State Historic Route". The first "Historic Route 66" marker in Missouri was erected on Kearney Street at Glenstone Avenue in Springfield, Missouri (now replaced—the original sign has been placed at Route 66 State Park near Eureka). 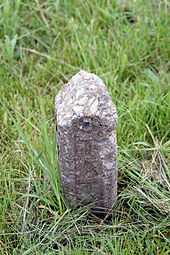 Other historic markers now line—at times sporadically—the entire 2,400-mile (3,900 km) length of road. In many communities, local groups have painted or stenciled the "66" and U.S. Route shield or outline directly onto the road surface, along with the state's name. This is common in areas where conventional signage for "Historic Route 66" is a target of repeated theft by souvenir hunters. Various sections of the road itself have been placed on the National Register of Historic Places. The Arroyo Seco Parkway in the Los Angeles Area and US 66 in New Mexico have been made into National Scenic Byways. Williams Historic Business District and Urban Route 66, Williams were added to the National Register of Historic Places in 1984 and 1989, respectively. In 2005, the State of Missouri made the road a state scenic byway from Illinois to Kansas. In the cities of Rancho Cucamonga, Rialto, and San Bernardino in California, there are US 66 signs erected along Foothill Boulevard, and also on Huntington Drive in the city of Arcadia. "Historic Route 66" signs may be found along the old route on Colorado Boulevard in Pasadena, San Dimas, La Verne, and along Foothill Boulevard in Claremont, California. The city of Glendora, California, renamed Alosta Avenue, its section of US 66, by calling it "Route 66". Flagstaff, Arizona, renamed all but a few blocks of Sante Fe Avenue as "Route 66"." Until 2017, when it was moved to the nearby Millennium Park, the annual June Chicago Blues Festival was held each year in Grant Park and included a "Route 66 Roadhouse" stage on Columbus Avenue, a few yards north of old US 66/Jackson Boulevard (both closed to traffic for the festival), and a block west of the route's former eastern terminus at US 41 Lake Shore Drive. Since 2001, Springfield, Illinois has annually held its "International Route 66 Mother Road Festival" in its downtown district surrounding the Old State Capitol. In 2018, the AASHTO designated the first sections of U.S. Bicycle Route 66, part of the United States Bicycle Route System, in Kansas and Missouri. Elk City, Oklahoma has the National Route 66 & Transportation Museum, which encompasses all eight states through which the Mother Road ran. Clinton has the Oklahoma Route 66 Museum, designed to display the iconic ideas, images, and myths of the Mother Road. Tulsa has the Cyrus Avery Centennial Plaza, located at the east end of the historic 11th Street Bridge over which the route passed, and which includes a giant sculpture weighing 20,000 pounds (9,100 kg) called "East Meets West". The sculpture depicts the Avery family riding west in a Model T Ford meeting an eastbound horse-drawn carriage. In 2020, Avery Plaza Southwest is scheduled to open, at the west end of the bridge, and should include replicas of three neon signs from Tulsa-area Route 66 motels from the era, being the Will Rogers Motor Court. Tulsa Auto Court, and the Oil Capital Motel. Future plans for that site also include a Route 66 Interpretive Center. Additionally, Tulsa has installed "Route 66 Rising," a 70-by-30-foot (21.3 by 9.1 m) sculpture on the road's eastern approach to town at East Admiral Place and Mingo Road. The Heart of Route 66 Auto Museum in Sapulpa features a 66-foot-high (20 m) gas pump, the world's tallest. A memorial museum to Will Rogers, the highway's namesake, is located in Claremore, while his birthplace ranch is maintained in Oologah. In Arizona, the highway originally covered 401 miles (645 km) in the state. Along much of the way, US 66 paralleled I-40. It entered across the Topock Gorge, passing through Oatman along the way to Kingman. Between Kingman and Seligman, the route is still signed as SR 66. Notably, just between Seligman and Flagstaff, Williams was the last point on US 66 to be bypassed by an Interstate. The route also passed through the once-incorporated community of Winona. Holbrook contains one of the two surviving Wigwam Motels on the route. Route 66 was the working title for the 2006 film Cars, set in large part in Radiator Springs, a composite of multiple real towns located on US 66. Part of the film's storyline revolves around how the once vibrant town fell into decline after the town was bypassed when US 66 was superseded by the new Interstate. "The Women on the Mother Road" is a documentary and oral history project created by filmmaker Katrina Parks to preserve the stories of women who worked and lived along the Route throughout its active years. ^ a b Special Committee on U.S. Route Numbering (June 26, 1985). "Route Numbering Committee Agenda" (Report). Washington, DC: American Association of State Highway and Transportation Officials. Retrieved April 16, 2014 – via Wikisource. ^ Rand McNally & Company (1947). Road and Reference Atlas (Map). Chicago: Rand McNally & Company. pp. 20–21, 25, 38–39, 54–55, 72–73, 80, 104, 107, 110. ^ "Route 66 Timeline". Legends of America. Retrieved April 15, 2012. ^ "A Table of Mileposts for the Original US 66 Alignment of 1926". Route 66 Web & Atlas. Retrieved April 15, 2012. ^ Illinois Department of Transportation (2007). Illinois Highway Map (Map) (2007–2008 ed.). [1:762,500]. Springfield: Illinois Department of Transportation. OCLC 244286974. Retrieved May 26, 2012 – via Illinois Digital Archives. ^ Google (May 26, 2012). "Bloomington, IL" (Map). Google Maps. Google. Retrieved May 26, 2012. ^ "Historic Route 66: Description". Historic66.com. Swa Frantzen. Retrieved November 22, 2014. ^ Weiser, Kathy (2014). "Beale's Wagon Road from New Mexico to California". Legends of America. Retrieved November 18, 2014. ^ "Cajon Pass". BackRoadsWest.com. Retrieved March 29, 2016. ^ Rand McNally (1926). Auto Road Atlas (Map). Chicago: Rand McNally. Retrieved April 15, 2012 – via Broer Maps Online. ^ a b Tremeear (2013), p. 10. ^ "Route 66 Birthplace Festival Set for Springfield, Missouri". Hemmings Motor News. Retrieved November 19, 2014. ^ "Then, Now and In Between". Springfield, Missouri, Convention & Visitors Bureau. Archived from the original on November 29, 2014. Retrieved November 19, 2014. ^ Kelly (2014), p. 159. ^ Weingroff, Richard F. (April 7, 2011). "From Names to Numbers: The Origins of the U.S. Numbered Highway System". Highway History. Federal Highway Administration. Retrieved April 15, 2012. ^ Kelly (2014), p. 170. ^ Missouri State Highway Commission (1926). Road Map of Missouri (PDF) (Map). Jefferson City: Missouri State Highway Commission. Retrieved April 15, 2012. ^ "The Great American Foot Race". Archived from the original on April 22, 2012. Retrieved April 15, 2012. ^ Dedek (2007), p. 35. ^ a b c d e "Route 66 History". Route 66 World. Retrieved November 18, 2014. ^ "Tower Station". Texas Historic Sites Atlas. Texas Historical Commission. Retrieved March 25, 2010. ^ National Park Service (n.d.). "Texas: Wheeler County". National Register of Historic Places. National Park Service. Retrieved March 25, 2010. ^ "Vega, Texas". TheRoadWanderer.net. Retrieved November 19, 2014. ^ Gribbin, John; Feynman, Richard (1997). A Life in Science. p. 96. ^ a b c National Park Service (n.d.). "Route 66". National Park Service. Retrieved November 19, 2014. ^ "Santa Fe, Pre 1938 Rt. 66 Alignment". Shadows of Old Route 66. Retrieved April 15, 2012. 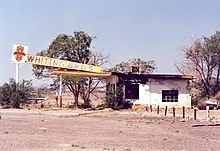 ^ "U.S. Route 66 in Arizona Multiple Property Submission". National Register of Historic Places. National Park Service. April 5, 1989. pp. 25–26. ^ Petroski, Henry (2006). "On the Road". American Scientist. 94 (5): 396–399. doi:10.1511/2006.61.396. ISSN 0003-0996. ^ "Route 66 Sidewalk Highway". Atlas Obscura. Retrieved August 26, 2017. ^ Cobb, Nathan (May 3, 1992). "Searching for Route 66". Boston Globe. p. 18 – via ProQuest Archiver. ^ "Historic Route 66 Association of Missouri website". Missouri66.org. April 14, 2012. Retrieved May 5, 2012. ^ Sonderman, Joe. "A Bit of Missouri 66 History". 66Postcards.com. Retrieved November 18, 2014. ^ "Finding Your Way on Route 66". Route-66.tv. Retrieved November 18, 2014. ^ Whiteis, David; Dahl, Bill (May 29, 2003). "20th Annual Chicago Blues Festival: The Reader's Guide". Chicago Reader. Retrieved June 18, 2017. ^ "13th Annual International Route 66 Mother Road Festival & Car Show". Route66fest.com. The Promotion Company. Retrieved November 22, 2014. ^ Juozapavicius, Justin (May 20, 2007). "Route 66 Motels an Endangered Species". Yahoo! News. Associated Press. Retrieved April 15, 2012. ^ Welch, Kevin (July 1, 1999). "House OKs Route 66 Bill". Amarillo Globe-News. Archived from the original on March 25, 2012. Retrieved April 15, 2012. ^ "Historic Route 66". World Monuments Fund. Retrieved April 15, 2012. ^ National Park Service (n.d.). "List of Sites". Discover Our Shared Heritage Travel Itinerary: Route 66. National Park Service. Retrieved June 11, 2017. ^ Cain, Fred M. "The Plan". Route 66 Recommissioning Initiative. Retrieved June 4, 2012. ^ drmcreif; paladin-64; preshusbane (2014). "Synopsis for Cars (2006)". IMDb. Amazon. Retrieved November 18, 2014. ^ Warnick, Ron (June 13, 2006). "Pixar's Route 66 Inspirations". Route66News.com. Retrieved November 18, 2014. ^ "Kansas Historic Route 66 Association". KSHistoricRoute66.com. Archived from the original on December 19, 2014. Retrieved November 18, 2014. ^ Charboneau, Michael (July 16, 2018). "Get Your Kicks Biking Route 66". CityLab. Retrieved September 7, 2018. ^ "The Peoples Highway". America on the Move. National Museum of American History. Retrieved March 6, 2009. ^ "National Route 66 & Transportation Museum". TravelOK.com. Retrieved August 2, 2018. ^ "Route 66 Museum". Oklahoma Historical Society. Retrieved August 2, 2018. ^ Barber, Brian (May 18, 2008). "Cyrus Avery plaza's Construction Nearly Finished". Tulsa World. Retrieved July 6, 2015. ^ Canfield, Kevin (January 30, 2019). 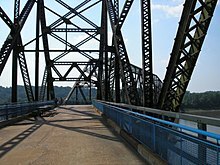 "It's a big part of our history: City should resurrect 11th Street bridge over Arkansas River, preservationists say". Tulsa World. Retrieved January 30, 2019. ^ "Cyrus Avery Centennial Plaza, Tulsa, Oklahoma". DrivingRoute66.com. Retrieved August 2, 2018. ^ "Will Rogers Memorial Museums". Retrieved January 10, 2019. ^ McClure, Rosemary (November 29, 2010). "Get Your Kicks on Route 66—and 499 Other Great Highways". Los Angeles Times. Retrieved December 7, 2010. ^ Stokes, Keith. "Historic Route 66: Galena, Kansas". KansasTravel.org. Retrieved June 12, 2012. ^ "Route 66 California". Road Trip USA. Avalon Travel. Retrieved November 12, 2014. ^ Weiser, Kathy (2010). "About California Route 66 - Info & History". Legends of America. Retrieved November 18, 2014. ^ "Old Route 66: Oatman". Road Trip USA. Avalon Travel. Retrieved November 18, 2014. ^ "Holbrook: Wigwam Village". Road Trip USA. Avalon Travel. Retrieved November 18, 2014. ^ "Route 66". AmericanSouthwest.net. John Crossley. Retrieved November 18, 2014. ^ "Route 66 History". Albuquerque Convention & Visitors Bureau. Retrieved November 18, 2014. ^ Weiser, Kathy (2011). 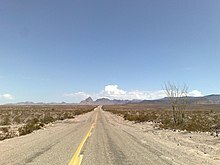 "About Texas Route 6:L Info & History". Legends of America. Retrieved November 18, 2014. ^ Weiser, Kathy (2013). "Route 66 Through Oklahoma". Legends of America. p. 2. Archived from the original on November 29, 2014. Retrieved November 18, 2014. ^ "Kansas Route 66 Main Page". Legends of America. 2012. Retrieved November 18, 2014. ^ Weiser, Kathy (2012). "About Missouri Route 66: Info & History". Legends of America. Retrieved November 18, 2014. 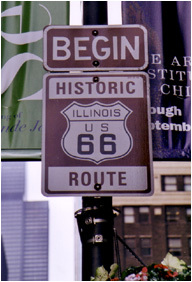 ^ "Historic Route 66: Illinois". Historic66.com. Retrieved November 18, 2014. ^ Illinois Division of Highways (April 1, 1955). Illinois Official Highway Map (Map). 1:805,000. Springfield: Illinois Division of Highways. Chicago and Vicinity inset. OCLC 713840599. Retrieved November 18, 2014 – via Illinois Digital Collections. ^ Snyder, Tom (2000). Welcome to the Old Road. New York: St Martin's Press. p. xii. ^ James, Clive (September 20, 2011). "Clive James on... Billy Connolly's Route 66, Sandhurst and Downton Abbey". The Telegraph. London. Retrieved October 2, 2016. ^ MacDonald, Brady (January 5, 2013). "The Real Route 66 Inspirations Behind Disney's Cars Land". Los Angeles Times. Retrieved October 2, 2016. ^ McGreal, Chris (August 27, 2009). "The Grapes of Wrath Revisited: Same Road, Same Grim Story, Same Sense of Optimism". The Guardian. London. Retrieved October 2, 2016. ^ "Daniel Amos: Then & Now". CCMclassic.com. Retrieved October 2, 2016. ^ "The Women on the Mother Road". The Women on the Mother Road. Retrieved July 11, 2018. Arizona Highways. July 1981. ISSN 0004-1521. Missing or empty |title= (help) Entire issue about Route 66. Dedek, Peter B. (2007). Hip to the Trip: A Cultural History of Route 66. Albuquerque: University of New Mexico Press. ISBN 9780826341945. Freeth, Nick (2001). Route 66. St. Paul, MN: MBI Publishing. ISBN 978-0-7603-0864-6. Kelly, Susan Croce (2014). Father of Route 66: The Story of Cy Avery. Norman: University of Oklahoma Press. ISBN 978-0-806-14778-9. Krim, Arthur; Wood, Denis (2005). Route 66: Iconography of the American Highway (1st ed.). Sante Fe, NM: Center for American Places. ISBN 9781930066359. Mahar, Lisa (2002). American Signs: Form and Meaning on Route 66. New York: Monacelli Press. ISBN 9781580931199. Rittenhouse, Jack D. (1989) . A Guide Book to Highway 66. Albuquerque: University of New Mexico Press. ISBN 978-0-8263-1148-1. Schneider, Jill (1991). Route 66 Across New Mexico: A Wanderer's Guide. Albuquerque: University of New Mexico Press. ISBN 978-0-8263-1280-8. Scott, Quinta; Kelly, Susan Croce (1988). Route 66: A Highway and Its People. Norman: University of Oklahoma Press. ISBN 978-0-8061-2291-5. Tremeear, Janice (2013). 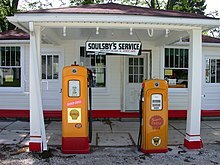 Illinois' Haunted Route 66. History Press. ISBN 978-1-626-19252-2. Wallis, Michael (2001). Route 66: The Mother Road. New York: St. Martin's Press. ISBN 978-0-312-28167-0. Baker, T. Lindsay (2016). Portrait of Route 66: Images from the Curt Teich Postcard Archives. Norman: University of Oklahoma Press. ISBN 9780806153414. OCLC 932618601. Bischoff, Matt D. (2005). Life in the Past Lane the Route 66 Experience: Historic Management Contexts for the Route 66 Corridor in California. Statistical Research, Inc. ISBN 978-1879442887. OCLC 68569034. 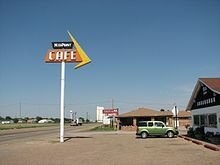 Wikimedia Commons has media related to U.S. Route 66. Wikivoyage has a travel guide for U.S. Route 66.